The world of work is changing faster and more drastically than at perhaps any other time in recent history. According to research from the World Economic Forum , 35% of the skills necessary to thrive in a job today will be different five years from now. How can we prepare for a workplace of the future if we’re not quite sure what it will look like? What skills or expertise should students focus on acquiring today if they want to succeed tomorrow? We spoke with five experts from the Forum’s Young Global Leaders community to get their opinion. A child today can expect to change jobs at least seven times over the course of their lives – and five of those jobs don’t exist yet. To get a better understanding of the skills needed in these jobs of the future, we conducted a country-wide survey of almost 900 companies. The results confirmed that soft skills – such as teamwork, knowledge of digital tools, an understanding of rules and regulations, responsibility and commitment – are the most relevant for the future. How can we teach our children these skills? In Argentina, we’re revolutionizing our curriculum to ensure they’re being taught across all subjects. 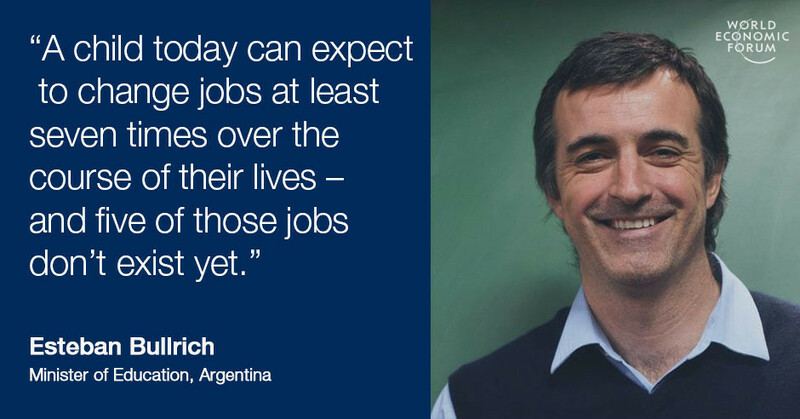 And in Buenos Aires, we’ve introduced innovative classes like coding and entrepreneurship. But the revolution extends beyond the school gates. For example, we’ve created neighbourhood youth clubs where children can continue learning these skills after the school day is over. We’re also ensuring that each student completes a 200-hour professional practice course, so they can apply all the skills they’re learning to the world of work. Data is one of the driving forces of the Fourth Industrial Revolution. But sometimes, when we perceive the world through data-driven models, it can become harder to see the humanity behind the numbers. Technology thus has the potential to erode our sense of empathy. The great challenge of the next 10 years for corporations and institutions will be to rebuild the empathy that we’ve lost. 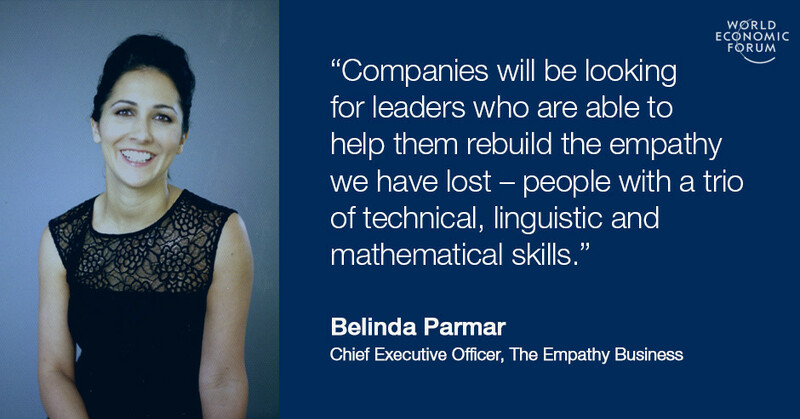 Companies will be looking for leaders who are able to help them do that – people with a trio of technical, linguistic and mathematical skills, who can make sense of the torrents of information that will continue to emerge. This will require a new kind of “data literacy”, which will be in short supply, and therefore one of the most important skills of tomorrow. The Fourth Industrial Revolution will mean that, over the next four years, a third of the skills the economy needs will change due to automation. It is therefore impossible to predict which “hard skills” children in today’s classrooms will need for jobs they will enter in 15 years’ time. Who could have conceived two decades ago that there would be a whole new industry in search engine optimization? The jobs that even artificial intelligence can’t replace will be those that require strong human character traits. Workers will need empathy – the ability to persuade and to work well with others. They will need a positive attitude – the ability to relearn, go back to college, and adapt to new situations as old skills become obsolete. Thriving in this uncertain world, where careers could change every few years, will also require resilience. These “soft” skills are hard to teach – and, as much as mathematics or science, will demand great teachers. The world of work is changing, and if we are to keep up, we must focus on learning new skills. One of the most important skills for the workforce of the future will be critical thinking. 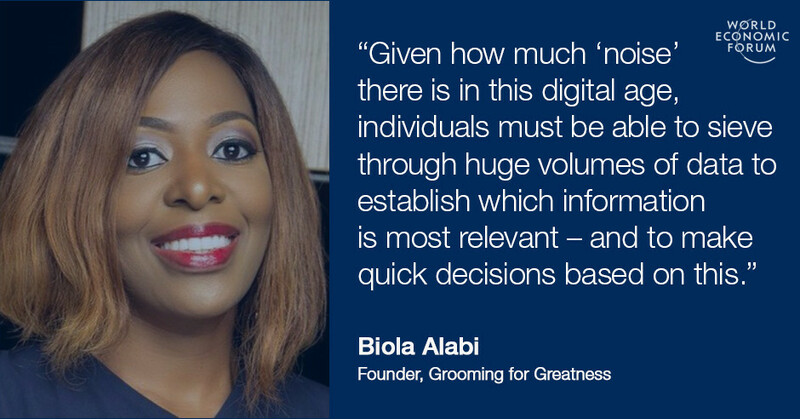 Given how much “noise” there is in this digital age, individuals must be able to sieve through huge volumes of data to establish which information is most relevant – and to make quick decisions based on this. Adaptability will be another crucial skill. The challenges organizations face are more complex than in the past, so specializations will no longer be enough to solve key problems. We will instead need to develop skills that allow us to navigate and find comfort in ambiguity. A person’s capacity to apply concepts, ideas and problem-solving techniques across different sectors will determine whether or not they’ll thrive in the future workplace. If all this is to happen, the way we learn must also change. Today’s classrooms need to focus more on teaching leadership, flexibility and teamwork instead of times tables. I’ve spent years working with some of Indonesia’s poorest. They are among the most entrepreneurial people you could meet – everyone is selling something. Of course, this is driven more by necessity than choice – it’s a survival skill. But I also think this entrepreneurial spirit could be the key to pulling people out of poverty. I’ve seen this first-hand: when these people are given access to capital, and are taught the skills needed to grow their business (such as financial literacy), their incomes often double or even triple. It’s these skills that will be the defining ones of the future, I believe. It is not enough to be innovative, or collaborative, it’s also about knowing when to apply each of them, and how they can be used in a business context. If we can ensure people like those I have worked with in Indonesia are equipped with these skills, we will help create a generation of innovators who are not only surviving, but are actually contributing to improving the state of the world. 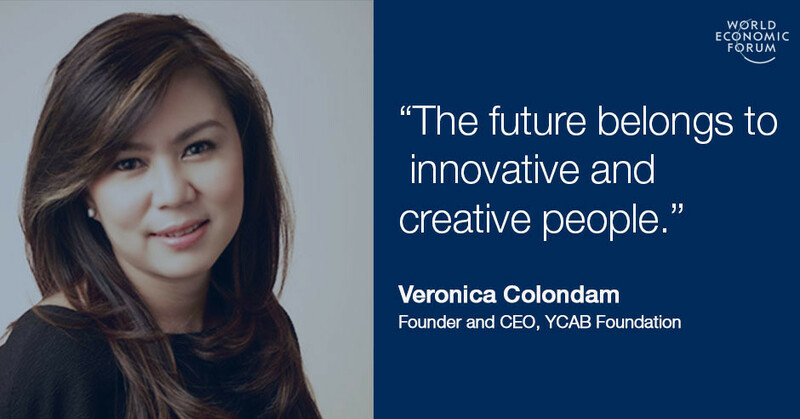 The future belongs to these innovative and creative people. The Young Global Leaders and Alumni Annual Summit is taking place from 18 to 21 October in Tokyo.